Joachim-Friedrich Huth (31 July 1896 – 27 March 1962) was a German soldier serving in the Luftstreitkräfte during World War I, in the Luftwaffe during World War II and Luftwaffe of the Bundeswehr in post World War II Germany. Huth retired from the military service in 1961 holding the rank of Generalleutnant. Joachim-Friedrich Huth was born on 31 July 1896 in Neuhof and entered military service in the Imperial German Army shortly before the outbreak of Word War I, on 13 July 1914. He was promoted to Leutnant on 4 January 1915 and served as platoon leader and company chief in the Infanterie-Regiment Nr. 58 (58th infantry regiment). He was injured three times. He transferred to the Luftstreitkräfte in June 1917 and claimed his first aerial victory on 28 January 1918. He was severely injured on 23 February 1918, losing his right lower leg. Huth was awarded both classes of the Iron Cross (1914) and the Knight's Cross to the House Order of Hohenzollern with Swords during the war. Oberleutnant Huth left the military service after the war. The treaty of Versailles had imposed severe restrictions on Germany's military strength and had denied Germany an air force. 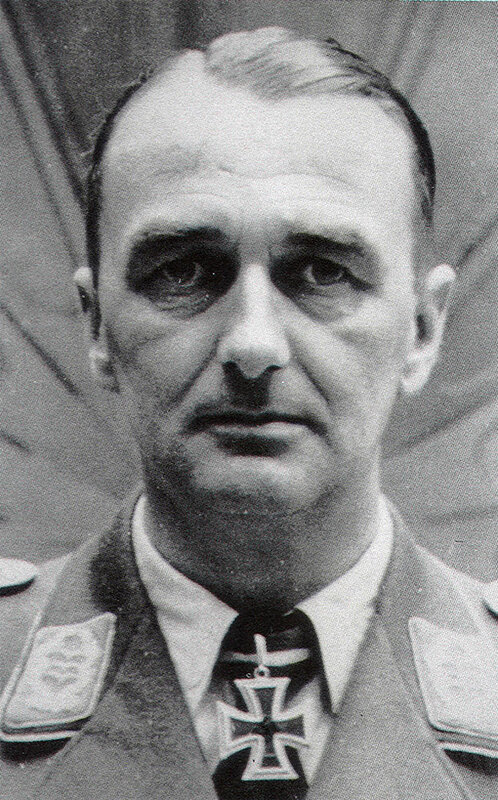 With Adolf Hitler's rise to power and the remilitarisation of Germany, Huth reentered the military service of the Luftwaffe on 1 March 1934, holding the rank of Hauptmann. He became the Geschwaderkommodore of the Zerstörergeschwader 26 "Horst Wessel." Huth earned the Knight's Cross of the Iron Cross (Ritterkreuz des Eisernen Kreuzes) on 11 September 1940 in this position for the successful leadership of his fighter wing in the Battle of France and Battle of Britain. In August, 1940, a military dispatch mentioned him by name for his wing's success in shooting down 51 enemy aircraft. Generalleutnant Huth commanded various fighter divisions from 1942 until 1944 before taking command of the 1. Jagdkorps (1st Fighter Corps) on 26 January 1945. He held this position until the end of the war, when he was taken prisoner by the British forces. He was released in 1946. In 1956 Joachim-Friedrich Huth joined the Bundeswehr after the remilitarisation of the Federal Republic of Germany, holding the rank of Generalmajor. He led the Luftwaffe school at Fürstenfeldbruck and, until his retirement, the Luftwaffengruppe Süd (Air Force Group South) in Karlsruhe. Huth retired on 30 September 1961 with a Großer Zapfenstreich (Grand Tattoo) holding the rank of Generalleutnant. Huth died half a year later on 27 March 1962 in Koblenz. * Knight's Cross of the Iron Cross on 11 September 1940 as Oberstleutnant and Geschwaderkommodore of ZG 26 "Horst Wessel"
* Fellgiebel, Walther-Peer (2000). Die Träger des Ritterkreuzes des Eisernen Kreuzes 1939-1945. Friedburg, Germany: Podzun-Pallas. ISBN 3-7909-0284-5. * Obermaier, Ernst (1989). Die Ritterkreuzträger der Luftwaffe Jagdflieger 1939 - 1945 (in German). Mainz, Germany: Verlag Dieter Hoffmann. ISBN 3-87341-065-6. * Scherzer, Veit (2007). Ritterkreuzträger 1939 - 1945 Die Inhaber des Ritterkreuzes des Eisernen Kreuzes 1939 von Heer, Luftwaffe, Kriegsmarine, Waffen-SS, Volkssturm sowie mit Deutschland verbündeter Streitkräfte nach den Unterlagen des Bundesarchives (in German). Jena, Germany: Scherzers Miltaer-Verlag. ISBN 978-3-938845-17-2. * Die Wehrmachtberichte 1939-1945 Band 1, 1. September 1939 bis 31. Dezember 1941 (in German). München: Deutscher Taschenbuch Verlag GmbH & Co. KG, 1985. ISBN 3-423-05944-3.